Soursop (Annona muricata) may have a funny name, but it has amazing health benefits! This tropical fruit is also known as graviola or guanabana. The outside has a spiny, green texture and the tangy sweet flesh is used in beverages, candy, and ice cream in Central and South American cuisine. Soursop is abundant in folate, niacin, thiamin, vitamin C, calcium, magnesium, potassium, and fiber. This tasty fruit is used in holistic medicine to treat an upset stomach, coughs, asthmatic symptoms, skin conditions, gout, fever and as a mild, natural sedative. Until recently, most of the analyses on the antioxidant rich soursop have scrutinized the roots, leaves, and seeds. According to the reports of current research, the humble, fresh fruit of the soursop has risen to a new level of importance; it has anti-cancer benefits! Scientists with the Tepic Institute of Technology (Instituto Tecnológico de Tepic – ITT) in Mexico discovered acetogenins, a compound in the fruit with incredible chemotherapeutic properties. 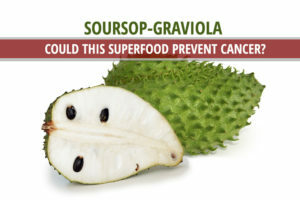 The researchers with ITT are studying soursop in an effort to find more anti-cancer foods that are readily available in Mexico due to the steadily rising cases of cancer among their population. In other words, they are searching for foods that prevent cancer and taste good so more people will eat them. Unprocessed soursop pulp can be frozen up to a year without deterioration in the acetogenin content. Ice cream produced from the pulp showed the same high concentrations of acetogenins, but ITT researchers need to determine at what point anti-cancer properties are compromised during the manufacturing process of mass food products and the addition of sugar. They hope to stimulate the production of juice, ice cream, yogurt, and other foods that the local people will enjoy while they (perhaps unknowingly) prevent or fight the growth of cancer cells. Using soursop to prevent cancer by including it in staple foods is both innovative and beneficial to the health of the people and the economy of Mexico. This fruit is not new. In fact, a 1997 study published in the Journal of Medicinal Chemistry found that Soursop was more than 200 times as effective as chemotherapy when tested on breast cancer cells!